Unless you have a lot of time on your hands this is a waste of money. It is just endless lists to read through. So frustrating that you can’t search on some of the menu items. The wine list is ridiculous u less you know exactly where the wine is made because it is by country and again you can’t just search a name. I wish I could get my money back totally not worth the money! Great app! Love the updates! A must-have for vegans on-the-go. Been waiting for this app since the Veganfreak podcast. Thanks! P.S. For those who were wondering, Skitties are phasing out gelatin. I just found a pack of sour Skittles without gelatin. Sorry, I can't give a review on this app yet, but I have to comment on the feedback below that some vegan waiter somewhere at an Olive Garden claimed that the red sauce at OG is "meat based". That is absolutely not true. I am not denying the waiter said that, but the waiter is completely full of it. I used to work at OG, I know for sure that it is vegan. This app is crap. Full of inaccuracies and omissions. You're better off calling a restaurant to ask. Panera Bread, for example - it varies by store, not all of the stores serve vegan bagels! Sometimes I wish there was an option to show vegetarian as well as vegan options. Other than that, cool app! I don't know any vegans that eat junk food or tons of processed foods, but that is what this app is all about. If you want your diet to consist of twizzlers and chips then buy this app. I do not believe that all items are listed are vegan, certainly not what I believe to be vegan. Very few of the restaurants are in my city. Also Brandon check for accuracy. My first look through had blantant errors such as Taco Bell ( don't get guac as it has sour cream which has milk and gelatin, and order beans w/o cheese); and candy errors (skittles have gelatin too). This app shows lots of food items in restaurants that may have cassin - like french fries - and also lot's of the food choices and market brands have natural flavorings and artificial flavorings which are not always dairy free. This app is an ok place to start - but still leaves lots of questions to be asked in restaurants and labels to be read in markets. I use this app because I have dairy allergies - so it is important that I do not make a mistake. Another user who really loved this app until the upgrade. It does not store menus you have clicked on for use if there is no wifi even though it's supposed to. Would love to see this fixed. Who wants to eat at Applebees? When there's a vegan cafe a block away? I just couldn't know it because this app does not do radius location search results. It's good if you're constantly forced to go to the *major chains*, but that's not what I was looking for. What a waste. Yay!!! This is an amazing & probably one of the best things for vegans everywhere. This is such a wonderful application. Often times, friends and family members to those that are vegan feel lost as to where they can take their loved ones. With this application in hand, all people can eat, drink, and be merry together! Keep up the great work. I checked Olive Garden web site myself and the Marinara Sauce is mushroom based, completely non-meat! Thanks for the helpful app so I don't have to look up each restaurants menu. Thanks for making my life easier when hanging out with meat consumers. Money well spent :) Look foward to future upates. It would be great to expand the list to include grocery and other alcohol drinks as well. For instance Belvedere vodka uses gelatin in thier proccess and is not vegan. Been waiting for this for a while, great job! Smooth interface, visually appealing, and simple setup. Five stars! Worth the money if you're vegan and travel a lot. I love it, I've been vegan for 4 years and I still find out new things from this app. Thanks! I don't even eat at fast food / chain restaurants very often, but I know this is going to come in handy a lot over time. Don't hesitate to pick this up. Oh, and if you haven't already... GO VEGAN! It stresses me out that this app is riddled with spelling errors yet it is supposed to be a trusted source regarding what we put in our bodies. Please spell check dude! Not worth the money at all. App is high in errors and omissions, wish I never purchased it. This is an amazing resource for vegans! This is the kind of app I was hoping for when I bought my ipod! Useful little app; well worth the purchase price. This app is the perfect companion for vegans on the road, as well as those vegans who find themselves out in situations where they're often stuck at non-vegan restaurants (which, I think, would be most of us at one time or another). A quick tap for each of the common restaurants in this extensive list, and you can immediately find what is vegan on the menu with zero fuss. Highly recommended for the vegans out there, this app includes a ton of restaurants, and the information appears to be valid, up-to-date, and accurate as far as I can tell. This app takes out the guesswork game that you sometimes have to play with waitstaff, and it'll seriously make your life easier if you're a vegan. Grab it now! Some good info, but could use some work! The restaurant portion of this app is great. The food portion looks to be the PETA I Can't Believe It's Vegan list. 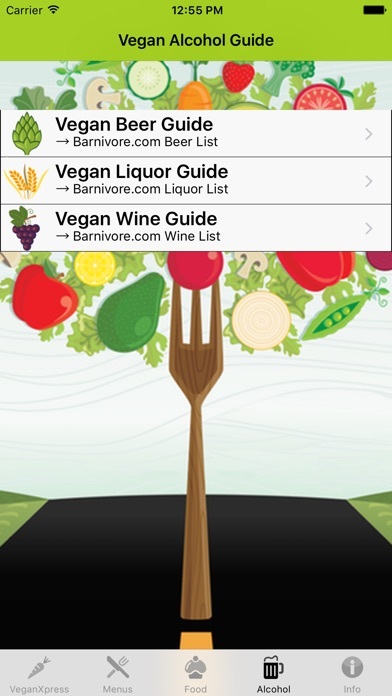 The Beer and Wine portions really could use help, The Vegan is Easy App does the Barnivore list much better. It's also missing the spirits list from Barnivore, which is more important to me! Not fully Vegan. Do not buy! This app creator did not take the time to fully understand what "vegan" is. For example, some of the ingredients contain "sugar"- which is very difficult to determine if it is vegan or not. It also suggest taking out cheese from pizza to make it vegan. You will look stupid ordering cheeseless pizza and might as well buy plain bread. I initially thought thus app was great. Now I want my money back and compensation for wasted time! I loved this app, until the update. After that, I had to be connected to a wifi signal in order to check restaurant menus. Before, all the information was stored on my device... I will give a better rating, if I do not have to connect to the Internet. Don't know if I can trust? I agree, I do not believe all these things to be vegan. Some even had cheese in the title. It is stupid to list something with dairy as vegan, we can all figure out that omitting the cheese would make it vegan. This apps is suppose to be about what is vegan with having to change it or make omissions. Also, Not all panera bagels are vegan, they contain l-cystine which is usually an animal protein used as a dough conditioner. Do your research, save your money! I never go out to eat without opening this up first. Frequent updates, email support and easy to understand. Worth every penny. I downloaded this app because I was super excited about having a Vegan food guide & after agreeing to pay for it and downloading it I received an error upon opening it that wouldn't let me open the app. I contacted the creator of this app and he told me that he didn't have any other issues with other users & to try deleting, rebooting & downloading again. I had the same results, so he told me to request a refund from iTunes support. I don't think it's my phone as I've not had any other issues with other app's I've downloaded. I'm disappointed that I can't use this app, and the response from the creator has implied that it's either my phone or user error that's causing this lack of functionality. LOVE this app! It makes travelling as a vegan so much easier! There's a lot of East Coast restaurants, hoping to see more West Coast friendly info, but still great, nonetheless. Unless you reside in California, this App is a total waste of money. Be advised that there are very few restaurants listed if you live somewhere else. Disappointed on this one. Let this be a warning prior to your purchase. Worst part is, I am new to the vegan lifestyle and this App has served zero purpose! I would love to see an update soon with more places! Also please make sure to keep current restaurants updated as they change and get new items. Thanks! I think this app is amazing, but it would be even better if it had more restaurants on it. I wouldn't buy this app again. The majority of the menus I've looked at have like 2 options on them (some with options that don't exist), some big chain restaurants aren't on the list and as a whole it just needs updating. Don't bother. "Problem reading some required data"
I was excited to download this app, until I opened it and was prompted with the message "Problem reading some required data, Try again?" After clicking "Yes" a dozen times I deleted and reinstalled three times. Oy vey. Waste of a dollar or two. This app is amazing. Whenever someone asks where I can eat I just show them this app. It's so great! Updated often and is wonderful. I just purchased this app and it doesn't work at all. It says I am missing some required data. I tried to delete and re-download. It didn't help. I'm so mad to have wasted my money. I love the new update!! The new icons and fancy looking menus make this app even better looking. I love the newly updated information it makes going out easier and even better now that you've added new items. As a long time vegan, this was one of the first apps I bought when I got my first smart phone. I travel a ton for work and this app has saved me from starvation on many occasions. It's also handy when you're outnumbered by non vegans and need to find a compromise where everyone will be happy. Used to be great, but there haven't been updates to menus and there are so many chain restaurants that could be added. Even coconut milk isn't listed for Starbucks - very behind the times. Perfect for the newly vegan or anyone doing a vegan challenge! This would have made the change so much easier! Looks like all the bad reviews are tech related, as in the user didn't realize uninstalling and re-installing app often fixes update issues. Would recommend this app to anyone vegan or who eats with vegans! There are so many unintentionally vegan foods! This seems like a good app, but the three restaurants I've tried looking up have not been on the menu guide. It would be lovely if more restaurants were added. Per the app support page, I deleted then re-installed it and it's working now. More restaurants and updated menus! What more could I ask for? App-essential for vegans or those who done with vegans! I'm so delighted to find out about all these vegan options at places I never thought I could eat! I use this app all the time!!! So great. 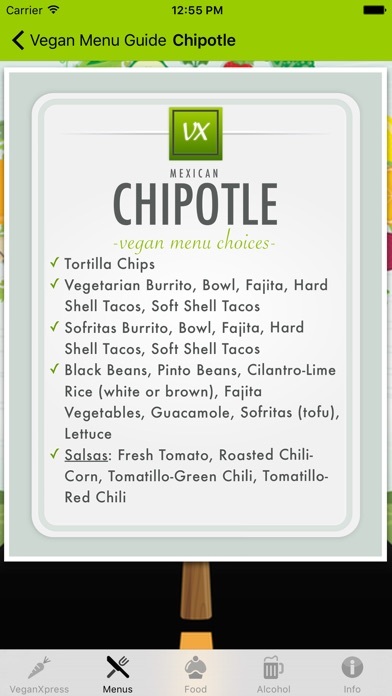 However, I was looking through some of their menus tho and some things, like Taco Bells bean burrito WITH cheese says its vegan.. That makes me wonder is Taco Bell using vegan cheese or is this app a little off.. I also wish there was a way to search instead of looking up food or drinks by brand. I just want a vegan white Zinfandel! Haha But over all, great app. Makes being vegan much easier when you're around nonvegans. I would say to still do your research but this app gives you a great general idea! Thank you so much for making such a useful and helpful app. I like this app but can we get an update for the menus?? Easy to use, and so helpful! 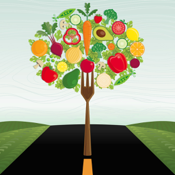 I no longer fear going hungry when traveling, or getting stuck in the salad-and-potato rut. Covers all the major chains. This app hasn't been updated in over a year, was going to recommend but don't even know if the lists are still true. Developer should keep it updated! This app has been so helpful throughout my transition into veganism. It makes it so easy to go out and eat at restaurants that are not 100% vegan and tells you what you can eat there. I love it ! Thanks! Why do I need to scroll all the way down the restaurants list instead of scrubbing alphabetically? Comes in handy when I am stuck going to chain non vegan restaurant. Just add a search and it will be even better. Does not work anymore. Says it is missing a plugin when you try to access anything. Thank you for the new updates! Best app for vegan menus! A must-have! Mc Donald's puts beef fat in the fries so how do you know really what you're getting? It's been a huge headache for me but this app really makes things easier by letting you know what's vegan and what's not. Granted a lot of menu items are not listed but that's because we live in a world full of death but at least it tells you what is available so you can order a 7 layer from say Taco Bell and tell them no meat, cheese, or sour cream. Blame the companies for lack of vegan items not this app! Well worth the price to download now to find a makeup version. This used to be my favorite go to app but it hasn't worked since the new year. Says there is a plug in missing! Please fix! It works just fine now. I was about to write a bad review because it had stopped working. Then I deleted and installed it again and it works. This app is a life saver when you need vegan food options. I do wish it had more restaurant to choose from. This app is so awesome. Super simple, great descriptions of what is and isn't vegan. It has been so helpful!! Thank you! I was excited to see this app. Helps take the guess work out of what to order at restaurants and bars. However, I paid $1.99 for this app due to a friend's comment telling me I had to have it. Well, I'm very disappointed to see that this hasn't been updated in over a year. Too bad, because I really like the app. Waste of money though because some of these restaurants don't offer these vegan options anymore. This app is a must for all vegans. I wish they'd organize their wine list differently but other than that, this app has always worked perfectly for me. I was really disappointed with this app. There's no search option, so every time you want to look up a food or restaurant, you have to scroll and pick through a 12-18 page list. A lot of the products listed aren't available in the southern states (where I live), so this was especially disappointing for me. I ended up googling everything I looked to this app for, because the info listed wasn't extensive or accurate enough to be helpful. Still, there were a few places and food items listed that were actually helpful, which is why I gave two stars.I love the idea of this app, but as it is now, it isn't any more convenient than just using google. I travel all around the country for work, and while I would prefer to eat at a gourmet vegan restaurant every day, nine time out of ten that is not an option. 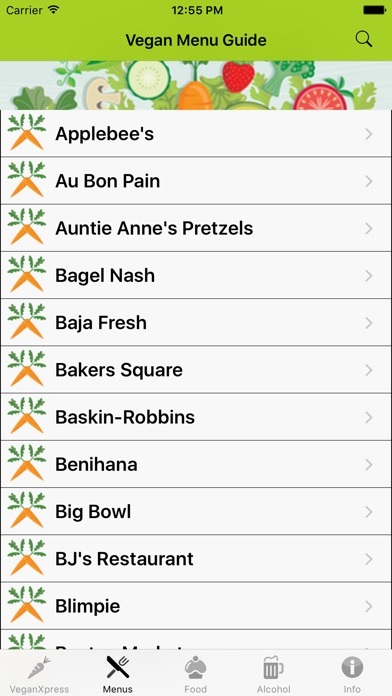 This app allows me to get a general idea of the vegan options at places that are available all over the country. A must have for any vegan who ventures away from home or has to go to fast food restaurants with family/friends/coworkers. Thanks VeganXpress! DO NOT BUY THIS APP!!! The developer keeps changing the app for the worse. 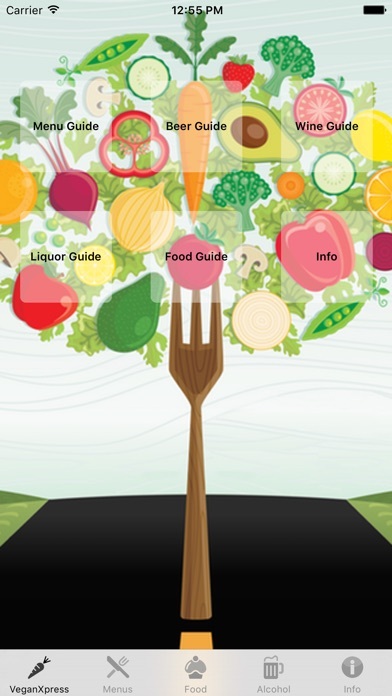 The alcohol-related sections no longer tell you which alcohols are NOT vegan, meaning you have to search half of them online to see if they aren't on the list because they aren't vegan or because Barnivore (the source) doesn't know them yet. (Same goes for certain restaurants, like Starbucks. The list gives the impression that all the Frapps are vegan, but the light ones are not and neither are many of the drizzles. Explaining that, especially for such customizable restaurants, is part of the purpose of the app.) Another problem is the way sections are organized. The wines are listed by letter and then by country, which is awkward. A search bar within each category would make more sense. Until this all gets fixed, don't buy the app. You won't use it. Great for Vegans on the go! I love the menu guide for when I'm out with friends. It basically synthesizes information from the restaurants websites in one place. Many times there are good options not listed that you can make vegan by omitting ingredients- but it's pretty comprehensive. Alcohol section helps when out at restaurants as well. I don't really use the grocery store section because it is hard to find what you're looking for with the long list- and sometimes I don't know what letter to look under...K for "Kellogg's" or F for "Frosted Flakes"... But overall it's been worth the money. I use it often! Just downloaded it. It's basically a list of a restaurants with a list of what's vegan. It doesn't have restaurants that are in your state only, but it has the popular food chains that are found in the US as well as alcohol lists by alphabetical order so say you wanna know if Jack Daniels is vegan you'd go to the J section and once clicked it'll say vegan or non vegan. It also includes a list of vegan snacks & candy & food in alphabetical order. For the price it's not bad! 8/10.